I was heading north on Interstate 81. Carole and I drove this route back in 2001 on our Civil War battlefields tour. I think I also drove this back in 2006, when I went to Williamsburg, Virginia for a Clan Thompson Society meeting. It was a gorgeous 9 a.m. and traffic was moving at a decent speed. I looked to the left and saw them. I have no idea where I was on the trip north but those are what I would call "real" windmills. If you're traveling with someone, they could make a note that you're at mile marker 68 near the Center Road exit. But, when you're alone, you either scramble to find paper and pen, which is not advisable when you're driving, or try to commit some exit number to memory. As I don't have much in the way of empty memory anymore, for details, where I was is lost to the mists of time. These two windmills looked to be in great condition. This technology, so much a part of farming last century, is rare to see. We had a windmill on the farm where I grew up. It pulled water from the well and pumped it to the cistern. From there, it was pumped into the house. To operate the windmill, you raised a wooden level on one of the legs. This lever was held down by a large piece of heavy gauge wire and the lever wasn't easy to raise or lower. If the windmill was operating and a storm approached, we'd have to go "tie down the windmill", but pulling down the lever so the whipping winds didn't break the spinning mechanism of the fins. I remember the hushed tones of sympathy extended to people whose windmills broke in a summer storm or a winter blizzard. Yes, the windmill worked all year. Dad must have had to do some kind of maintenance on the gears, etc, to keep them operational in January, but it worked. I also don't remember any kind of motor attached to the windmill to run it when the days were becalmed. I also don't remember the windmill working much at night simply because there is an inherent grinding noise these things make that just prohibits sleep unless you are incredibly tired. Yet for sheer sustainability, you can't beat a windmill for doing what you need done. 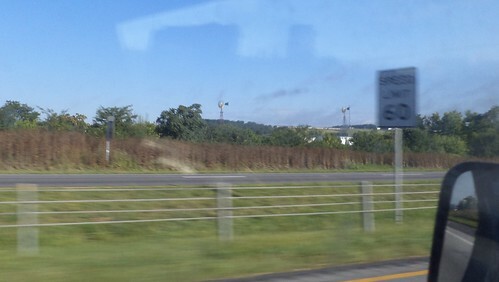 Seeing these things in the distance along the Interstate made me wonder about why they are there. It might be the need to be low on the electrical totem pole that these are operational. Perhaps someone is truly concerned with power generation, maybe taking themselves off the grid. Or it could be someone just thinks they are cool. Whatever the case, they were an interesting item to see on the trip home.